Taco Bell has long been thought of for the “fourth meal” or last one of the day for college students heading home after a late night out with their friends. Now, the company wants to be your “first meal” as well and enter the highly competitive breakfast market. Taco Bell has been working on the move for some time now. After nearly five years of testing, the company has finally launched the new menu this year in roughly 800 restaurants. 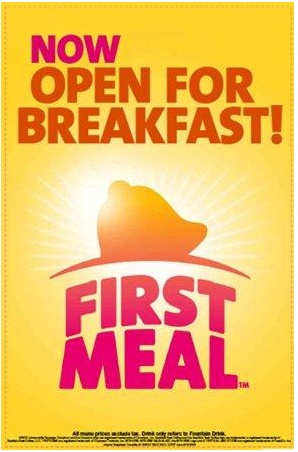 With 11 items in the breakfast line (called “First Meal”), the offerings include not only traditional morning foods such as scrambled eggs, sausage, bacon, tortilla and hash browns, but also features new additions such as iced coffees and miniature cinnamon buns. But the real winner might just be a new drink called “Mtn. Dew A.M.” – a combination of Mountain Dew and Tropicana Orange Juice mixed up in the restaurants! With prices from 99 cents to $2.79, the new menu is bound to be a hit with the college crowd. Poll students about their love of Taco Bell and ask who would go to TB for breakfast. Why? Have students bring up the Taco Bell Website and examine the products and menus offered by the company. What is Taco Bell’s target market? How does the company appeal to this target? Discuss the role that market research plays in determining how a company expand their product offerings. List on the board the types of research companies need to do – customer profile, geography, food choices, pricing, competition, product selection, etc. Divide students into teams. Have each team outline a marketing research project that they would do if they were Taco Bell considering a new breakfast menu. Next, have each team select another company whose products they buy. Have each team design a similar research project for another company. Have each team define a research objective, research strategy, population, sample, and data gathering plan. Debrief the projects by comparing the research plans.